Altai horses were developed in the Altai Mountains of Central Asia and are highly adapted to the severe climates in the region. For many centuries, they were bred for characteristics most needed by the mountain tribesmen and nomads, including strong cardiovascular, respiratory, muscular, and skeletal systems. They are best known for strong physical attributes, hearty constitutions, and the ability to adapt to harsh environments. On average, the Altai stand 13.2 - 13.3 hands high and their coat colors range from chestnut, bay, black, gray, and sometimes leopard spotted. Their coats are somewhat coarse and they have an average length head with fleshy neck and a long and slightly dipped back. They have shorter, but properly set legs. 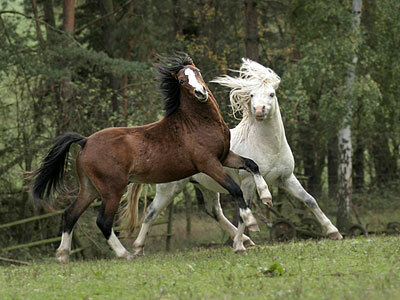 Recently, Altai Horses have been crossed with pure breeds of Lithuanian, Russian, and Soviet Heavy Draft horses for a new breed. This has resulted with good performance records, larger, stronger and healthier horses. They are also more sure-footed over the harsh, steep mountain trails that they navigate.